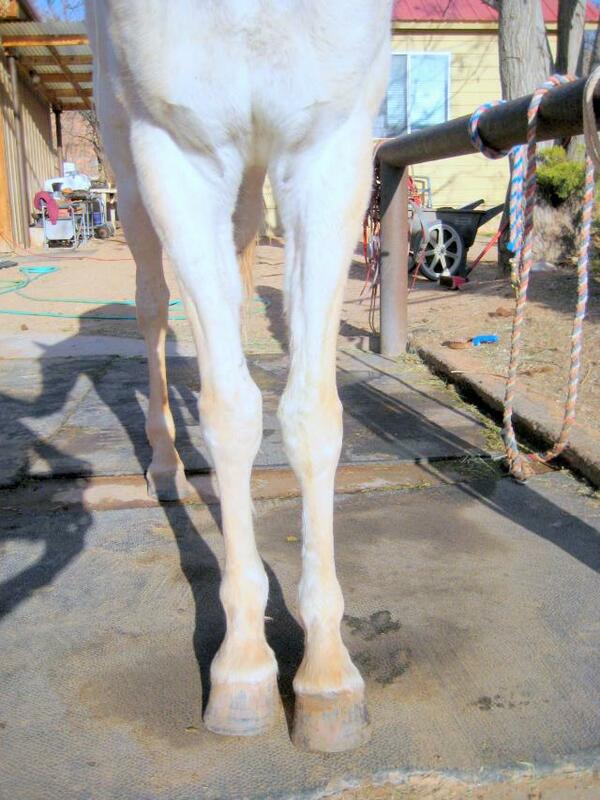 During the last two discussions on hoof capsule distortions, we looked at flares and high/low syndromes and clubfeet. Today, we want to examine the medial/lateral balance in more detail. Question: which side of the hoof will grow more? Which side will grow more? During the last posts we discussed that a hoof will follow the path of least resistance, that means, it will grow more on that side that receives less pressure. Horse A has a very narrow stance, the legs are inside a plum line drawn from the point of the shoulder. The outside hoof wall receives more pressure than the medial side. Therefore the medial or inside hoof wall will grow more. Horse B has a wide stance. The plum line from the shoulders falls to the inside of the horse’s legs. More pressure is therefore placed on the inside of the hoof. The outside or lateral side will grow more. If you need to double check, simulate the stance with your own feet: wide stance and narrow stance, where do you feel more or less pressure? If you checked the last answer as correct, consider the following. It is correct that most horses will travel differently in a trot and canter than while standing in a stall or pasture. However, what is the time element involved here? No matter how much you train your horse, it will always stand many more hours than working. Let’s say, you work your horse 4 hours every day. That is a lot and hardly anybody will do that day in day out. That would leave 20 hours a day where the horse will stand or slowly walk. Therefore, the horses hooves will grow more the way it is standing, that is a 6:1 ratio in this case. So, the way a horse moves, in regards to hoof wall growth, will have a comparably small impact. 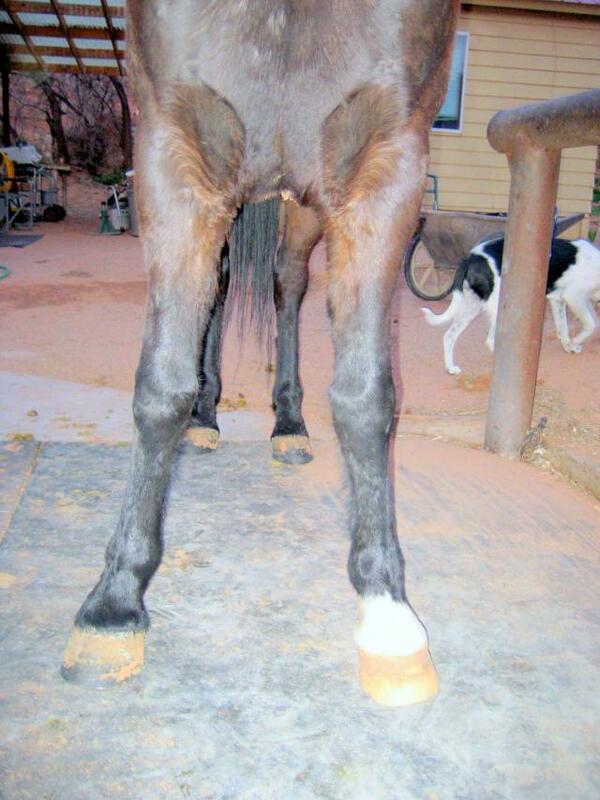 The horse’s conformation is the main determining factor on medial/lateral hoof growth. Were we to leave things as they happen, in both examples shown above, with time, the hoof capsule would distort more and more, the coronet band pushed higher and higher on one side till the famous straw breaks the camel’s back and we encounter quarter cracks and sheared heels. It is of utmost importance that both sides of the hoof will be trimmed evenly at each trimming interval. Where there is more growth, more hoof wall needs to get trimmed. You can measure the sides of each hoof with a caliper or a measuring tape. 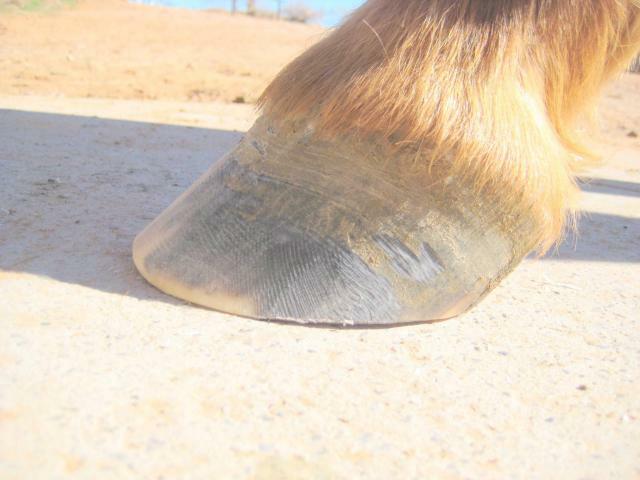 Watch for a pushed up and arched coronet band as a sure sign of excess pressure through excess hoof wall growth. Observe the arched coronet band and arched stress lines in the hoof wall: a sign of imbalance here. This side of the hoof grew more and is experiencing stress. This side needs to get trimmed more; maybe it should even get floated. That can be done before using any Easyboot Gloves or Glue-On boots. When floating one side of the hoof, you are shortening it sufficiently so that the opposite side is bearing more pressure for the time being. Within a relatively short period of time, sometimes as little as an hour, the coronet band will relax and the hoof can balance itself. This process will be happening faster if the hoof is relatively soft in texture, contains a lot of moisture, and the horse is placed on a hard surface. Hard and dry hooves will require more time. 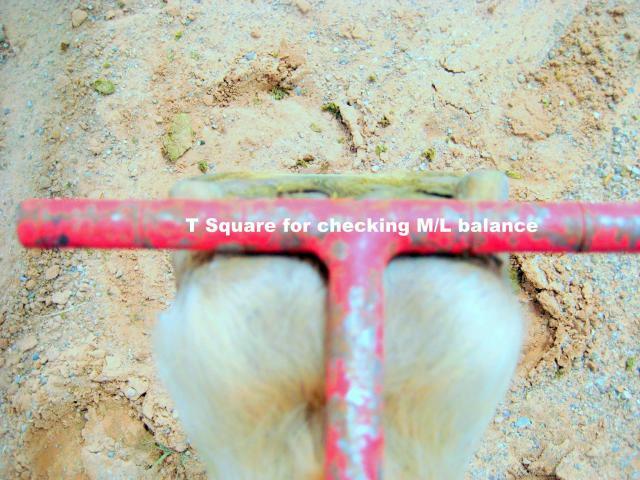 An additional tool available for a trained Hoof Care Technician is the T square. It can give valuable information. However, a word of caution: it is not an absolute indicator of a balanced hoof and of medial/lateral balance. If you have a hoof angle deviation it could give you an incorrect answer. Use it only as a cross reference tool. Notice the longer hoof wall on the right side, in this case. For information and education regarding lower leg conformation and advice for selecting an endurance prospect, visit the Global Endurance Training Center website and blog. For additional resources on hoof protection and products to manage the barefoot hoof, visit the EasyCare website. Have fun, ride fast or slow, but always enjoy life and learning! Previous articleWhat’s In Your Closet? Hi, I was taught never to use a t square because it aligns the hoof with the lower leg, rather than the frog which is a true indicator of the entire leg. Can you comment on this?